MAKE SOME STRATEGIC STATE AGENCY "CONNECTIONS"
Talk to state agency representatives and learn about the future procurement needs. Prime and Sub-contractors: Meet to discuss future subcontracting and/or joint venture opportunities. 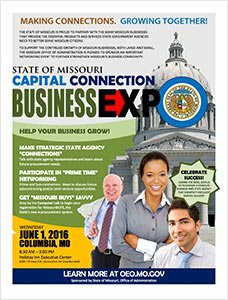 Stop by the Expo's computer lab to register for MissouriBuys, and receive hands-on help with related technical questions. The Expo will include an award ceremony recognizing a Missouri business that demonstrates excellent service delivery practices; and a state agency that exhibits creativity and resourcefulness in connecting with the business community. Check back often for new updates about the Expo. Don't miss your chance to help your business grow! 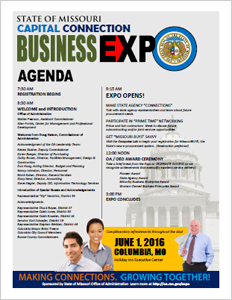 To Register for the Expo, CLICK HERE!